Women feel labor coming in different ways. For some, it's slow with lots of signals. For others, it comes in a rush with very little warning. If you’re unsure, it’s best to call your doctor or midwife. Contractions: Your uterus tightens and relaxes as it gets ready to push out your baby. That causes pain that at first feels like cramps during your period. The pain gets stronger as delivery gets closer. Back Pain: During labor, you may have lower back pain and cramps that don't get better or go away. It can also be part of your contractions. The pain usually starts in your back and then moves around to the front of your body. Water Breaks: Your baby is growing in a bag of protective fluid called the amniotic sac. This bag breaks when it's time for your baby to be born. This can be a gush of fluid down your legs or just a slow, little trickle. Did You Have Any Jelly-Like Discharge? When you're pregnant, a plug of mucus blocks your cervix. As your cervix gets softer and bigger to prepare for labor, this plug loosens and drops out. It's usually a small amount of pinkish or brown-colored jelly-like discharge. Are You ‘Dilated’ and ‘Effaced’? To stretch enough to make room for your baby, your cervix has to thin out and get bigger. When you hear your doctor talk about how far your cervix is "effaced" (thinned) and "dilated" (opened), that's what she means. Your cervix has to be dilated at least 10 centimeters before you can start pushing to deliver your baby. Most of us have heard about a women’s biological clock ticking. We know that a woman will get to a point in her life when she can no longer have children. But, there are more and more women waiting until their 30’s to decide to have children. For other women, a surprise pregnancy in their mid 30s or early 40’s is also common. So even though every pregnancy is special and every baby deserves the best prenatal care, for mothers over 35 a few extra precautions should be taken. 1. Getting pregnant might be harder after 35. Sometimes women ovulate less frequently. Eggs become harder to fertilize and women are more likely to have endometriosis (a condition that can cause uterine pain and infertility). All these things could make it harder to get pregnant. 2. Consider genetic testing. Since risk for some birth defects increases with maternal age and possibility for miscarriage does as well, genetic testing is a good option for those who choose it. This could include a long interview and/or blood work from both parents. This is a personal choice you have to make. Genetic testing provides parents with information about potential issues at birth, such as Down’s syndrome and neural tubal defects. a. Take Folic Acid (prenatal vitamins) daily to prevent neural tubal defects. d. Avoid cigarettes, alcohol and other drugs. The best thing a mom-to-be over 35 can do is get early and proper prenatal care. If you know you want to get pregnant, talk to your doctor before it happens and get advice about what is going to be safe and healthy for both you and the baby. 1. You need to eat. There's no need to go crazy counting calories just stick to appropriate serving sizes and you'll be on your way. If you really want a benchmark, aim for 1,800 to 2,000 calories daily if you don't exercise, and up to 2,400 if you do. If you're breastfeeding exclusively, you can add another 500 calories to your daily intake. 2. Focus on your hunger cues. Pay attention to how you feel: On a scale of one to ten, if one is "haven't-eaten-in-days starving" and ten is "stuffed like a Thanksgiving turkey," aim to be around a four when you start a meal and a six when you finish. 3. Watch the clock. Eat something about every three or four hours to keep your blood-sugar and energy levels steady throughout the day. 4. Go slow. Plan to lose only one or two pounds a week, especially if you're breastfeeding. Losing weight too quickly can impact your milk supply. Mastitis is inflammation of tissue in one or both mammary glands inside the breast. Mastitis usually affects lactating women - women who are breastfeeding, producing milk. The patient feels a hard, sore spot inside the breast. Mastitis can occur as a result of an infection or a blocked milk duct. Some mothers mistakenly wean their babies when they develop mastitis. In most cases breastfeeding can continue during mastitis. Many mothers with mastitis worry about passing the infection to their infant. It is important to understand that breast milk contains many antibacterial components that protect the infant from infection. Mothers who are breastfeeding are typically encouraged to continue nursing their babies while receiving treatment for mastitis. Breastfeeding can help clear plugged ducts, which will reduce the accumulation of milk and help the infant maintain proper nursing techniques. In general, mothers do not have to worry about harming the health of their baby as the antibiotics used to treat these infections are usually safe for breast-feeding. If you have an infection and it's diagnosed early, it's easy and quick to treat. As soon as you recognize this combination of signs and symptoms, it's time to contact your doctor. You should start feeling improvement within 48 hours of starting antibiotics, and it won't be long before you feel 100 percent better! An untreated infection can lead to breast abscesses (an infected cyst). For small abscesses, aspiration with a needle and syringe plus antibiotics is needed, though it may be necessary to repeat the aspiration more than once. There are so many benefits to reading to your child and the sooner the better. How early should you begin? You could begin as early as your 2nd trimester of pregnancy. Studies show that at 23 weeks of your pregnancy, your baby is able to hear and respond to your voice and can experience a simple form of learning in the uterus. You may also start as an infant. 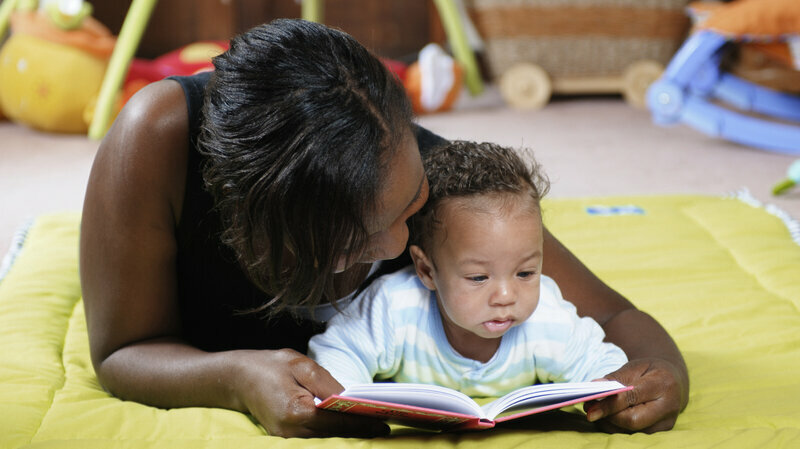 Reading activities may include reading stories, playing music or even simply talking to your baby. You may also tell stories to your baby. Whether you begin during pregnancy or infancy, this is a great bonding opportunity! Books for babies should be easy for them to hold such as board books, cloth, and plastic. Baby may try and put in his mouth while you are trying to read and this is normal and ok. The more you practice the better baby will adjust and adapt. You don’t even have to finish the book. The important thing to keep in mind is that you are introducing books to your baby. “I Can Do It Myself” by Stephen Krensky. Hearing a soft or calm voice helps your baby know comfort and security. The benefits to reading are evident and the more you read the larger impact you will have in many social, emotional, motor, and developmental areas that contribute to the overall success of your child’s future and lasting love for reading. If you have not started it is also never too late to start reading. So let’s begin! even if the mother is not with him all the time. To do this, you must know how to store refrigerate and defrost breast milk properly. Having a milk reserve available for any occasion, whether for work or other circumstances in which the mother is absent, it can solve many problems and keep baby healthy and happy. At first it may seem tedious, but practice can make extracting and storing milk easier no time. For many, hand express milk is more comfortable and reduces the risk of bacteria. But for others the breast pump is the way to go. Before extractions is essential that the mother washes her hands and utensils that are going to be sued for both extractions. You must use food grade containers, glass or hard plastic, provided with a lid, or special bags to store breast milk (they can be obtained from the pharmacy or stores). It is recommended to save about 2 to 4 ounces and date each package. The time that breast milk can last, depends on the temperature of the refrigerator or freezer. Human milk can be stored for several days in the refrigerator and up to several months in the freezer. 25 ° for 4-8 hours. and between 0 and 4, it can remain in 5 to 8 days. If it is inside the fridge, two weeks… while in a separate freezer, (commercial constant temperature) of -19º,it can last 6 months or more. The best method is to place the container under running cold water and letting the water go out progressively hotter until milk reaches room temperature. Do not thaw breast milk in the microwave or boil it, just bring it to room temperature. And remember Whenever there is no contact with baby saliva, thawed milk can be kept refrigerated for 24 hours. If milk has been frozen and thawed, it can be refrigerated up to 24 hours to be used later, but should never be frozen again. All of a sudden you are gaining all this weight, but in the back of your mind you think, OH NO!!!! Ask your doctor if you are able to exercise before beginning an exercise program. , he or she can offer personalized exercise suggestions. Most exercises are safe to perform during pregnancy, as long as you exercise with caution and do not overdo it. Low-impact aerobics (taught by a certified aerobics instructor). These activities carry little risk of injury, benefit your entire body, and can be continued until birth. PREGNANT? “My body is not ever going to be the same” is one of many common concerns for women. Your emotions along with changes to your body might be difficult for women to accept what is going on. To help you when you’re stressed you can reach out to your doctor to discuss healthy eating and acceptable work outs for your pregnancy. Cooking meals and preparing snacks at home, along with not picking up fast food are important to make sure that you are eating healthier. It’s important that you are providing your body with all the nutrients you need to have a healthy pregnancy. You should ask about “acceptable work-outs” because you want to make sure that you do not hurt yourself while pregnant, safety first! Don’t forget, it’s normal that some women shoe size goes up. Women’s feet swell due to the extra weight which is applying pressure to your feet. The beauty of the body changes is that you remind yourself that you are carrying a special gift. Be sure to make time for yourself. Every woman’s pregnancy is different. So don’t be embarrassed to ask more questions when seeing your OBGYN. Welcome to the Baby Blog! Healthy Families Network hosts this blog, with content provided by the lead organization, San Antonio Healthy Start and other Network members. We are thrilled to bring you news, events and tips on having a healthy, happy pregnancy and a healthy start to the new life you've just created.